High-precision, fast, CFR21 Part11 compliant and easy to use ! precisely controlled chamber temperature conditions, selectable in the following range: 0°C to 60°C, with a precision of 0.2C. measurements. The implemented user management systems allows a simple and intuitive operation. The new large, touch-screen graphic LCDisplay gives a clear overview. The menu software is simple and intuitive. For a connection to a printer or a PC, an RS-232 or USB interface is built into the device. A PC-Software for Win9x/2000/NT/XP is included in the instrument delivery. To learn more about Water Activity click here. Backed by Neutec Group's reputable technical service level, the Novasina instruments will assure your product quality! Calibration, IQ/OQ and Preventative maintanance services are offered, please inquire. 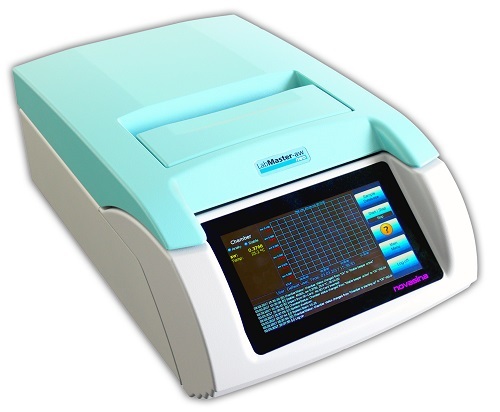 We have been using the LabMaster-Neo quite a bit to characterize our samples. It is very easy to use and does not take up much space. It was well worth the purchase!